Having been a gamer for most of my life, it might come as a surprise that I have never taken a single virtual step in the WORLD OF WARCRAFT universe. Despite the seemingly limitless replayability that has been constantly enjoyed by millions throughout the years, the series has simply never appealed to me. It’s not as though I have never been a PC gamer - the likes of Battlefield, Counter-Strike, and countless others have kept me entertained for as long into each generation as my PC’s could manage. Yet, until recently, Warcraft was merely a statistical machine to me - a demonstration of the immense pulling power that gaming possesses. All that changed however, during London’s most recent Video Games Live show in 2008. Having gone in impatiently awaiting the likes of Metal Gear Solid, Halo, and Mass Effect, it came as a great surprise that as I departed through the crowds , all I could think about was when I would be able to hear the mesmerizing World of Warcraft medley for a second time. Fused with the beautiful CGI images, the themes of Warcraft were forever scorched into my musical memory, and the series has since provided several outstanding cues that stand amongst the greatest that gaming has to offer. 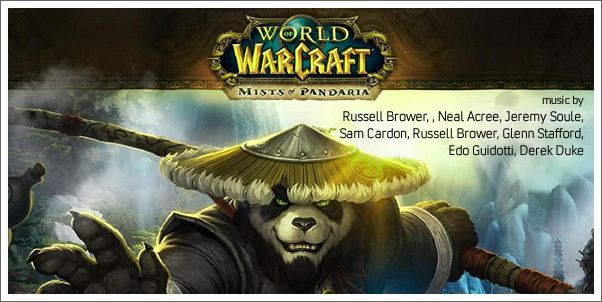 The series has set such an impressive precedent, and MISTS OF PANDARIA is possibly the most captivating soundtrack to come from the long-running series’ musical library. The music of the Warcraft series has always perfectly matched the games in terms of scope, providing musical backdrops, that of Wrath of the Lich King for example, that would not seem out of place in such blockbuster franchises as Lord of the Rings. Releases such as Wrath of the Lich King, Fall of the Lich King, and Cataclysm have had a typical dark and brooding quality to them, centering on the daunting task that each new adventurer faces. Mists of Pandaria certainly adds a little comedic flair to the lore, but still maintains that essential air of scale so often attributed to Warcraft. Musically, Mists of Pandaria is instantly noticeable as being a significantly different experience to the previous releases, but continues the Warcraft tradition of thrilling, large-scale orchestral action music - a tradition that those at Blizzard will no doubt be proud of, and rightly so. This comes as no surprise given the musical talent in Blizzard’s armory. RUSSELL BROWER leads an all-star cast of Blizzard stalwarts that make up the latest Warcraft’s musical clan. Wrath of the Lich King, Starcraft II, and Diablo III composers BROWER, NEAL ACREE, GLENN STAFFORD, EDO GUIDOTTI, and DEREK DUKE are joined by SAM CARDON, and JEREMY SOULE (The Elder Scrolls V: Skyrim). Mists of Pandaria is bursting with talent, and none goes wasted in this magnificent video game score.